Winter gets a bad rap for a number of reasons. Cold, dark, possibly lonely as the Island empties out and more stores say goodbye until spring. But there is always one wonderful aspect of the off-season, as reliable as the spring peepers, the community suppers. 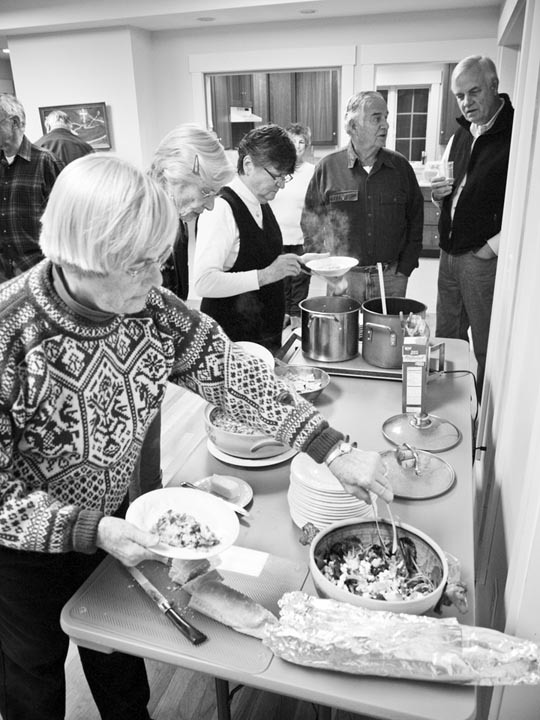 Each winter, churches around the Island hold free suppers on different days of the week. These days it is possible to get a full meal every weeknight but Thursday. The food is free and delicious, much of it donated, and the companionship the perfect antidote for too many quiet nights alone. On Monday nights beginning at 5 p.m. the Methodist Church hosts a supper in the Baylies Room of the Old Whaling Church in Edgartown. On Tuesdays, the Chilmark Church, located at 9 Menemsha Crossroad, holds a soup supper beginning at 5:30 p.m.
On Wednesdays, the West Tisbury Congregational Church (next to Alley’s) begins its suppers at 5:30 p.m.
On Fridays, Grace Episcopal Church on Woodlawn avenue in Vineyard Haven holds its community supper from 5 to 6:30 p.m..
Go ahead, enjoy them all.